Armando, who works in environmental services for David Grant Medical Center at Travis Air Force Base, was surprised when she called again. This time he took her to urgent care, and then to the Emergency Department at UC Davis Medical Center. After imaging confirmed a brain tumor, Ana was referred to a local neurosurgeon but the consultation was delayed for several weeks. Armando asked his colleague at David Grant, neurosurgeon Jonathan Forbes, M.D., what he would do, and that’s how Ana found Edie Zusman, M.D., a neurosurgeon and medical director for the NorthBay Center for Neuroscience, who has performed more than 1,000 brain tumor surgeries. “We were able to get an appointment right away,” she recalled. Ana had a meningioma, a tumor that forms on the membranes that cover the brain and spinal cord just inside the skull. About 90 percent of these tumors are benign, but they can grow and cause serious problems. Dr. Zusman told Ana she didn’t think it was malignant, but she couldn’t be certain until surgery. They discussed several options and Ana decided to wait until the end of canning season, so she could work the full season—June to October—at Campbell’s Soup Co. in Dixon. Indeed, there were no symptoms. Ironically, even the initial headache, which triggered the imaging tests, may have been coincidental. As the canning season drew to a close, the company held a traditional end-of-season celebration for employees. The next day, family members came in from near and far; her three children, five grandchildren, a brother, a sister, a cousin. Because neurosurgeons can specifically map out their surgical plans, we have a higher degree of safety and accuracy, explained Dr. Zusman. “We can do a better job removing the entire tumor, because we’re aware of where the anatomic structures and blood vessels are,” she said. Working under the operating microscope, Dr. Zusman used an interhemispheric approach between the folds of the brain in a narrow area next to major blood vessels. During the five-hour surgery, she and her team were able to remove the entire tumor, including the dural membrane, where it originated, achieving a surgical cure. In addition, Dr. Zusman was able to operate below the top of the scalp, in such a way that the surgical area was easy for Ana to later obscure with her long, dark hair. In support of Armando and Ana, Dr. Forbes accepted an invitation from Dr. Zusman to observe the surgery, and he witnessed the successful and complete removal of a 4-centimeter tumor, roughly the size of an apricot. 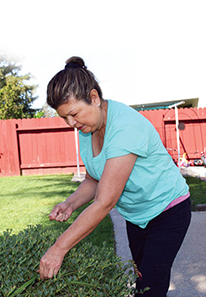 Only five days after her surgery, Ana walked out of NorthBay Medical Center and went home. A week later, she was walking through Costco with her daughter. And she was thrilled to be back in her garden. “That’s my therapy,” she said with a smile, gazing across her beautifully manicured back yard. At her first checkup following the surgery, Dr. Zusman was amazed. “She told me, Ana, I barely recognize you, you look so relaxed!’ She said it helped that I was very active before the surgery,” recalled Ana. a chip in, because she’s come back as sharp as ever, remembering many details of their life together. “I’m blessed everything went so well,” said Ana, pointing out that she avoided radiation, because they removed the entire tumor. She only used pain pills for a couple of days, and after that, it was Tylenol all the way. Now she’s looking forward to being back to work at Campbell’s this summer. She likes to stay busy. But she promises to listen to her body, and slow down when she needs to. And she’s taking time to count her blessings.